The Keystone XL pipeline project is not just a pipeline – it’s a lifeline. It’s a lifeline for the tens of thousands of out-of-work Americans who will gain direct jobs from its construction and implementation, and it’s a lifeline for the millions of Americans who feel the pain of rising oil prices. The Keystone pipeline would create 20,000 jobs, generate more than $20 billion in new revenue for the U.S. economy, and 70% of Americans support its construction. By needlessly delaying this project for the last 1,638 days, President Obama has revealed his complete disregard for American energy independence and American job growth. The President claims to be committed to “a future where we’re in control of our own energy, and our security and prosperity are not tied to unstable parts of the world.” However, his policies tell a much different story. Denying this project not only jeopardizes our economic recovery, but puts us at the mercy of unfriendly foreign nations and threatens our national security. Today, I joined Rep. Lee Terry (R-NE) and introduced bipartisan legislation (H.R. 3) that would allow for the immediate construction of the Keystone XL pipeline by removing the artificial barriers put in place by Obama Administration and State Department regulations and lawsuits filed by other liberal special interest groups. 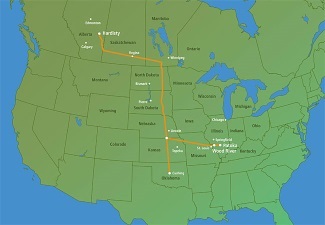 The bill will remove the requirement of a presidential permit to begin construction on the pipeline from the Canadian border to Nebraska while eliminating the red tape imposed by the federal bureaucracy. Since 2009, this Administration has senselessly blocked this project—while even the Senate has recognized the importance of Keystone XL. Texans know firsthand the economic benefits of energy exploration. This bill is an important step toward restoring sound energy policies—the time is now for immediate action.